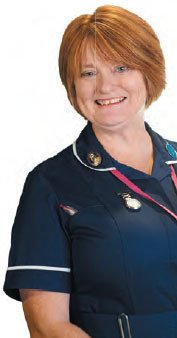 'I am clinical nurse lead for Local Care Force, an agency that provides nurses to care homes, intermediate care units and private hospitals in Yorkshire. My work is exciting and unique. I support agency nurses and provide regular supervisions and appraisals while they are working. Support can be delivered either face to face on site, while meeting in town for a coffee or over the telephone. I try to support nurses for their assignment by establishing that they are prepped before they attend and ensuring that they have the appropriate skills to meet the patients’ needs. I also support nurses if concerns arise, for example with medication errors, safeguarding worries or other issues. My role also calls for me to develop a rapport with service managers who request nurses from us. Building good relationships and offering support is paramount in maintaining successful professional networks.